Dr Jeremy Rossman joined the School of Biosciences in November 2011 as a Lecturer in Virology. He received a Ph.D. in Emerging Infectious Diseases from the Uniformed Services University of the Health Sciences (Bethesda, Maryland, USA) for his studies on T lymphocyte signal transduction (2006). Following his Ph.D., he conducted postdoctoral research with Prof. Robert Lamb at the Howard Hughes Medical Institute (Northwestern University, Evanston, Illinois, USA) where he investigated the mechanisms of influenza virus budding (2006-2011). 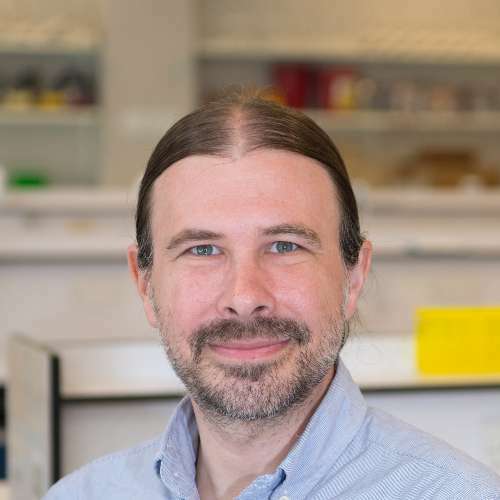 His current research focuses on host-pathogen interactions of negative sense RNA viruses and interdisciplinary research on public health and humanitarian aid. Jeremy is a member of the Microbial Pathogenesis Group. The overall goal of our laboratory is to better understand the complex process of infectious disease outbreaks, from pathogen replication through epidemic response, in order to provide new options for disease treatment and containment. Our research is focused in two main strands. The goal of Strand 1 is to identify key interactions that regulate viral replication, determine the biophysical mechanics that underlay these reactions and place these reactions in the context of the host cell in order to better understand the larger context of host-pathogen interactions and fundamental cell biology. Current research is focused on the host-pathogen interactions governing the replication of negative sense RNA viruses, including Influenza A virus, respiratory syncytial virus and Ebola virus. From these interactions we are interrogating multiple stages of viral replication ranging from viral assembly and budding to interactions with the host immune system. These processes are being investigated using a broad range of state-of-the-art methodologies, including: super-resolution microscopy, cryo-TEM, single molecule imaging, neutron reflectivity, solution NMR, lipidomics, molecular dynamics simulations and machine learning algorithms, with the goal of opening new avenues for drug discovery, vaccine development and ultimately the treatment and prevention of these viral diseases. The goal of Strand 2 is to increase the efficiency and effectiveness of humanitarian aid during infectious disease epidemics. Our research is designed to provide interdisciplinary evidence on the best practices for epidemic response, specifically increasing our understanding of human factors and showing how the integration of these factors into a coordinated response can affect the efficacy of disease containment and can be used to create integrated, effective, context-adaptable protocols for epidemic response. Director and Founder, Research-Aid Networks, an interdisciplinary non-profit organisation delivering more effective humanitarian aid and long-term sustainable community development through collaborations between researchers, aid organizations and local communities. Director and Co-Founder, Research Integrity Labs Ltd., a Computing-Bioscience collaborative company designing automated tools for the detection of scientific malpractice. Member of the Science Media Centre, promoting scientist engagement with the media. Perot, B. et al. (2018). Autophagy diminishes the early interferon- ? response to influenza A virus resulting in differential expression of interferon- stimulated genes. Cell death & disease [Online]. Available at: http://dx.doi.org/10.1038/s41419-018-0546-5. Cantoni, D. and Rossman, J. (2018). Ebolaviruses: New roles for old proteins. PLOS Neglected Tropical Diseases [Online] 12:e0006349. Available at: https://doi.org/10.1371/journal.pntd.0006349. recent expansion of ebolavirus research has led to the discovery of new protein functions. death caused by VP40-secreted exosomes to new roles for VP24 in viral particle formation. more encompassing view of ebolavirus replication and pathogenicity. Madsen, J. et al. (2018). Entropic Forces Drive Clustering and Spatial Localization of Influenza A M2 During Viral Budding. Proceedings of the National Academy of Sciences of the United States of America [Online] 115:E8595-E8603. Available at: https://doi.org/10.1101/291120. The influenza A matrix 2 (M2) transmembrane protein facilitates virion release from the infected host cell. In particular, M2 plays a role in the induction of membrane curvature and/or in the scission process whereby the envelope is cut upon virion release. Here we show using coarse-grained computer simulations that various M2 assembly geometries emerge due to an entropic driving force, resulting in compact clusters or linearly extended aggregates as a direct consequence of the lateral membrane stresses. Conditions under which these protein assemblies will cause the lipid membrane to curve are explored and we predict that a critical cluster size is required for this to happen. We go on to demonstrate that under the stress conditions taking place in the cellular membrane as it undergoes large-scale membrane remodeling, the M2 protein will in principle be able to both contribute to curvature induction and sense curvature in order to line up in manifolds where local membrane line tension is high. M2 is found to exhibit linactant behavior in liquid-disordered/liquid-ordered phase-separated lipid mixtures and to be excluded from the liquid-ordered phase, in near-quantitative agreement with experimental observations. Our findings support a role for M2 in membrane remodeling during influenza viral budding both as an inducer and a sensor of membrane curvature, and they suggest a mechanism by which localization of M2 can occur as the virion assembles and releases from the host cell, independent of how the membrane curvature is produced. Martyna, A. et al. (2017). Membrane remodeling by the M2 amphipathic helix drives influenza virus membrane scission. Scientific Reports [Online]. Available at: http://dx.doi.org/10.1038/srep44695. Calnan, M. et al. (2017). The response to and impact of the Ebola epidemic: towards an agenda for interdisciplinary research. International Journal of Health Policy and Management [Online] 7:402-411. Available at: http://dx.doi.org/10.15171/ijhpm.2017.104. The 2013-16 Ebola virus disease (EVD) epidemic in West Africa was the largest in history and resulted in a huge public health burden and significant social and economic impact in those countries most affected. Its size, duration and geographical spread presents important opportunities for research than might help national and global health and social care systems to better prepare for and respond to future outbreaks. This paper examines research needs and research priorities from the perspective of those who directly experienced the EVD epidemic in Guinea. Methods: The paper reports the findings from a research scoping exercise conducted in Guinea in 2017. This exercise explored the need for health and social care research, and identified research gaps, from the perspectives of different groups. Interviews were carried out with key stakeholders such as representatives of the Ministry of Health, NGOs, academic and health service researchers and members of research ethics committees (N=15); health practitioners (N=12) and community representatives (N=11). Discussion groups were conducted with male and female EVD survivors (N=24) from two distinct communities. Results: This research scoping exercise identified seven key questions for further research. An important research priority that emerged during this study was the need to carry out a comprehensive analysis of the wider social, economic and political impact of the epidemic on the country, communities and survivors. The social and cultural dynamics of the epidemic and the local, national and international response to it need to be better understood. Many survivors and their relatives continue to experience stigma and social isolation and have a number of complex unmet needs. It is important to understand what sort of support they need, and how that might best be provided. A better understanding of the virus and the long-term health and social implications for survivors and non-infected survivors is also needed. Conclusion: This study identified a need and priority for interdisciplinary research focusing on the long-term socio-cultural, economic and health impact of the EVD epidemic. Experiences of survivors and other non-infected members of the community still need to be explored but in this broader context. Qian, Z. et al. (2016). Discovery and Mechanism of Highly Efficient Cyclic Cell-Penetrating Peptides. Biochemistry [Online]:1-1. Available at: http://dx.doi.org/10.1021/acs.biochem.6b00226. Previous cell-penetrating peptides (CPPs) generally have low cytosolic delivery efficiencies, because of inefficient endosomal escape. In this study, a family of small, amphipathic cyclic peptides was found to be highly efficient CPPs, with cytosolic delivery efficiencies of up to 120% (compared to 2.0% for Tat). These cyclic CPPs bind directly to the plasma membrane phospholipids and enter mammalian cells via endocytosis, followed by efficient release from the endosome. Their total cellular uptake efficiency correlates positively with the binding affinity for the plasma membrane, whereas their endosomal escape efficiency increases with the endosomal membrane-binding affinity. The cyclic CPPs induce membrane curvature on giant unilamellar vesicles and budding of small vesicles, which subsequently collapse into amorphous lipid/peptide aggregates. These data suggest that cyclic CPPs exit the endosome by binding to the endosomal membrane and inducing CPP-enriched lipid domains to bud off as small vesicles. Together with their high proteolytic stability, low cytotoxicity, and oral bioavailability, these cyclic CPPs should provide a powerful system for intracellular delivery of therapeutic agents and chemical probes. Martyna, A. et al. (2016). Curvature Sensing by a Viral Scission Protein. Biochemistry [Online]. Available at: http://dx.doi.org/10.1021/acs.biochem.6b00539. Membrane scission is the final step in all budding processes wherein a membrane neck is sufficiently constricted so as to allow for fission and the release of the budded particle. For influenza viruses, membrane scission is mediated by an amphipathic helix (AH) domain in the viral M2 protein. While it is known that the M2AH alters membrane curvature, it is not known how the protein is localized to the center neck of budding virions where it would be able to cause membrane scission. Here, we use molecular dynamics simulations on buckled lipid bilayers to show that the M2AH senses membrane curvature and preferentially localizes to regions of high membrane curvature, comparable to that seen at the center neck of budding influenza viruses. These results were then validated using in vitro binding assays to show that the M2AH senses membrane curvature by detecting lipid packing defects in the membrane. Our results show that the M2AH senses membrane curvature and suggest that the AH domain may localize the protein at the viral neck where it can then mediate membrane scission and the release of budding viruses. Zhirnov, O. et al. (2016). Intravirion cohesion of matrix protein M1 with ribonucleocapsid is a prerequisite of influenza virus infectivity. Virology [Online] 492:187-196. Available at: http://dx.doi.org/10.1016/j.virol.2016.02.021. Influenza virus has two major structural modules, an external lipid envelope and an internal ribonucleocapsid containing the genomic RNA in the form of the ribonucleoprotein (RNP) complex, both of which are interlinked by the matrix protein M1. Here we studied M1-RNP cohesion within virus exposed to acidic pH in vitro. The effect of acidification was dependent on the cleavage of the surface glycoprotein HA. Acidic pH caused a loss of intravirion RNP-M1 cohesion and activated RNP polymerase activity in virus with cleaved HA (HA1/2) but not in the uncleaved (HA0) virus. The in vitro acidified HA1/2 virus rapidly lost infectivity whereas the HA0 one retained infectivity, following activation by trypsin, suggesting that premature activation and release of the RNP is detrimental to viral infectivity. Rimantadine, an inhibitor of the M2 ion channel, was found to protect the HA1/2 virus interior against acidic disintegration, confirming that M2-dependent proton translocation is essential for the intravirion RNP release and suggesting that the M2 ion channel is only active in virions with cleaved HA. Acidic treatment of both HA0 and HA1/2 influenza viruses induces formation of spikeless bleb-like protrusion of ~25nm in diameter on the surface of the virion, though only the HA1/2 virus was permeable to protons and permitted RNP release. It is likely that this bleb corresponds to the M2-enriched and M1-depleted focus arising from pinching off of the virus during the completion of budding. Cooperatively, the data suggest that the influenza virus has an asymmetric structure where the M1-mediated organization of the RNP inside the virion is a prerequisite for infectious entry into target cell. Badham, M. and Rossman, J. (2016). Filamentous Influenza Viruses. Current Clinical Microbiology Reports [Online] 3:155-161. Available at: http://dx.doi.org/10.1007/s40588-016-0041-7. Rossman, J. and Martyna, A. (2014). Alterations of membrane curvature during influenza virus budding. Biochemical Society Transactions [Online] 42:1425-1428. Available at: http://dx.doi.org/10.1042/BST20140136. Influenza A virus belongs to the Orthomyxoviridae family. It is an enveloped virus that contains a segmented and negative-sense RNA genome. Influenza A viruses cause annual epidemics and occasional major pandemics, are a major cause of morbidity and mortality worldwide, and have a significant financial impact on society. Assembly and budding of new viral particles are a complex and multi-step process involving several host and viral factors. Influenza viruses use lipid raft domains in the apical plasma membrane of polarized epithelial cells as sites of budding. Two viral glycoproteins, haemagglutinin and neuraminidase, concentrate in lipid rafts, causing alterations in membrane curvature and initiation of the budding process. Matrix protein 1 (M1), which forms the inner structure of the virion, is then recruited to the site followed by incorporation of the viral ribonucleoproteins and matrix protein 2 (M2). M1 can alter membrane curvature and progress budding, whereas lipid raft-associated M2 stabilizes the site of budding, allowing for proper assembly of the virion. In the later stages of budding, M2 is localized to the neck of the budding virion at the lipid phase boundary, where it causes negative membrane curvature, leading to scission and virion release. da Silva, D. et al. (2014). The Influenza Virus Neuraminidase Protein Trans-membrane and Head Domains Have Coevolved. Journal of Virology [Online] 89:1094-1104. Available at: http://dx.doi.org/10.1128/JVI.02005-14. Trans-membrane domains (TMDs) from single-spanning membrane proteins are commonly viewed as membrane anchors for functional domains. Influenza virus neuraminidase (NA) exemplifies this concept, as it retains enzymatic function upon proteolytic release from the membrane. However, the subtype 1 NA TMDs have become increasingly more polar in human strains since 1918, which suggests that selection pressure exists on this domain. Here, we investigated the N1 TMD-head domain relationship by exchanging a prototypical “old” TMD (1933) with a “recent” (2009), more polar TMD and an engineered hydrophobic TMD. Each exchange altered the TMD association, decreased the NA folding efficiency, and significantly reduced viral budding and replication at 37°C compared to at 33°C, at which NA folds more efficiently. Passaging the chimera viruses at 37°C restored the NA folding efficiency, viral budding, and infectivity by selecting for NA TMD mutations that correspond with their polar or hydrophobic assembly properties. These results demonstrate that single-spanning membrane protein TMDs can influence distal domain folding, as well as membrane-related processes, and suggest the NA TMD in H1N1 viruses has become more polar to maintain compatibility with the evolving enzymatic head domain. Rossman, J. and Lamb, R. (2013). Viral Membrane Scission. Annual Review of Cell and Developmental Biology [Online] 29:551-569. Available at: http://www.annualreviews.org/doi/abs/10.1146/annurev-cellbio-101011-155838?journalCode=cellbio. Virus budding is a complex, multistep process in which viral proteins make specific alterations in membrane curvature. Many different viral proteins can deform the membrane and form a budding virion, but very few can mediate membrane scission to complete the budding process. As a result, enveloped viruses have developed numerous ways of facilitating membrane scission, including hijacking host cellular scission machinery and expressing their own scission proteins. These proteins mediate scission in very different ways, though the biophysical mechanics underlying their actions may be similar. In this review, we explore the mechanisms of membrane scission and the ways in which enveloped viruses use these systems to mediate the release of budding virions. Rossman, J., Leser, G. and Lamb, R. (2012). Filamentous Influenza Virus Enters Cells via Macropinocytosis. Journal of Virology [Online] 86:10950-10960. Available at: http://dx.doi.org/10.1128/JVI.05992-11. Influenza virus is pleiomorphic, producing both spherical (100-nm-diameter) and filamentous (100-nm by 20-?m) virions. While the spherical virions are known to enter host cells through exploitation of clathrin-mediated endocytosis, the entry pathway for filamentous virions has not been determined, though the existence of an alternative, non-clathrin-, non-caveolin-mediated entry pathway for influenza virus has been known for many years. In this study, we confirm recent results showing that influenza virus utilizes macropinocytosis as an alternate entry pathway. Furthermore, we find that filamentous influenza viruses use macropinocytosis as the primary entry mechanism. Virions enter cells as intact filaments within macropinosomes and are trafficked to the acidic late-endosomal compartment. Low pH triggers a conformational change in the M2 ion channel protein, altering membrane curvature and leading to a fragmentation of the filamentous virions. This fragmentation may enable more-efficient fusion between the viral and endosomal membranes. Rossman, J. and Lamb, R. (2011). Influenza virus assembly and budding. Virology 411:229-36. Influenza A virus causes seasonal epidemics, sporadic pandemics and is a significant global health burden. Influenza virus is an enveloped virus that contains a segmented negative strand RNA genome. Assembly and budding of progeny influenza virions is a complex, multi-step process that occurs in lipid raft domains on the apical membrane of infected cells. The viral proteins hemagglutinin (HA) and neuraminidase (NA) are targeted to lipid rafts, causing the coalescence and enlargement of the raft domains. This clustering of HA and NA may cause a deformation of the membrane and the initiation of the virus budding event. M1 is then thought to bind to the cytoplasmic tails of HA and NA where it can then polymerize and form the interior structure of the emerging virion. M1, bound to the cytoplasmic tails of HA and NA, additionally serves as a docking site for the recruitment of the viral RNPs and may mediate the recruitment of M2 to the site of virus budding. M2 initially stabilizes the site of budding, possibly enabling the polymerization of the matrix protein and the formation of filamentous virions. Subsequently, M2 is able to alter membrane curvature at the neck of the budding virus, causing membrane scission and the release of the progeny virion. This review investigates the latest research on influenza virus budding in an attempt to provide a step-by-step analysis of the assembly and budding processes for influenza viruses. Rossman, J. et al. (2010). Influenza Virus M2 Ion Channel Protein Is Necessary for Filamentous Virion Formation. Journal of Virology [Online] 84:5078-5088. Available at: http://dx.doi.org/10.1128/JVI.00119-10. Influenza A virus buds from cells as spherical (?100-nm diameter) and filamentous (?100 nm × 2 to 20 ?m) virions. Previous work has determined that the matrix protein (M1) confers the ability of the virus to form filaments; however, additional work has suggested that the influenza virus M2 integral membrane protein also plays a role in viral filament formation. In examining the role of the M2 protein in filament formation, we observed that the cytoplasmic tail of M2 contains several sites that are essential for filament formation. Additionally, whereas M2 is a nonraft protein, expression of other viral proteins in the context of influenza virus infection leads to the colocalization of M2 with sites of virus budding and lipid raft domains. We found that an amphipathic helix located within the M2 cytoplasmic tail is able to bind cholesterol, and we speculate that M2 cholesterol binding is essential for both filament formation and the stability of existing viral filaments. Rossman, J. et al. (2010). Influenza Virus M2 Protein Mediates ESCRT-Independent Membrane Scission. Cell [Online] 142:902-913. Available at: http://dx.doi.org/10.1016/j.cell.2010.08.029. Many viruses utilize host ESCRT proteins for budding; however, influenza virus budding is thought to be ESCRT-independent. In this study we have found a role for the influenza virus M2 proton-selective ion channel protein in mediating virus budding. We observed that a highly conserved amphipathic helix located within the M2 cytoplasmic tail mediates a cholesterol-dependent alteration in membrane curvature. The 17 amino acid amphipathic helix is sufficient for budding into giant unilamellar vesicles, and mutation of this sequence inhibited budding of transfected M2 protein in vivo. We show that M2 localizes to the neck of budding virions and that mutation of the M2 amphipathic helix results in failure of the virus to undergo membrane scission and virion release. These data suggest that M2 mediates the final steps of budding for influenza viruses, bypassing the need for host ESCRT proteins. Rossman, J. and Lamb, R. (2010). Swine-origin Influenza Virus and the 2009 Pandemic. American Journal of Respiratory and Critical care Medicine [Online] 181:295-296. Available at: http://dx.doi.org/10.1164/rccm.200912-1876ED. Rossman, J. and Lamb, R. (2009). Autophagy, apoptosis, and the influenza virus M2 protein. Cell Host & Microbe [Online] 6:299-300. Available at: http://dx.doi.org/10.1016/j.chom.2009.09.009. Viral subversion and inhibition of host cell autophagy has been documented for several viruses. In this issue of Cell Host & Microbe,Gannagé et al. (2009) show that the influenza virus M2 integral membrane protein blocks autophagosome maturation, significantly affecting host cell apoptosis. Langel, F. et al. (2008). Multiple protein domains mediate interaction between Bcl10 and MALT1. Journal of Biological Chemistry [Online] 283:32419-31. Available at: http://dx.doi.org/10.1074/jbc.M800670200. Bcl10 and MALT1 are essential mediators of NF-kappaB activation in response to the triggering of a diverse array of transmembrane receptors, including antigen receptors. Additionally, both proteins are translocation targets in MALT lymphoma. Thus, a detailed understanding of the interaction between these mediators is of considerable biological importance. Previous studies have indicated that a 13-amino acid region downstream of the Bcl10 caspase recruitment domain (CARD) is responsible for interacting with the immunoglobulin-like domains of MALT1. We now provide evidence that the death domain of MALT1 and the CARD of Bcl10 also contribute to Bcl10-MALT1 interactions. Although a direct interaction between the MALT1 death domain and Bcl10 cannot be detected via immunoprecipitation, FRET data strongly suggest that the death domain of MALT1 contributes significantly to the association between Bcl10 and MALT1 in T cells in vivo. Furthermore, analysis of point mutants of conserved residues of Bcl10 shows that the Bcl10 CARD is essential for interaction with the MALT1 N terminus. Mutations that disrupt proper folding of the Bcl10 CARD strongly impair Bcl10-MALT1 interactions. Molecular modeling and functional analyses of Bcl10 point mutants suggest that residues Asp(80) and Glu(84) of helix 5 of the Bcl10 CARD directly contact MALT1. Together, these data demonstrate that the association between Bcl10 and MALT1 involves a complex interaction between multiple protein domains. Moreover, the Bcl10-MALT1 interaction is the second reported example of interactions between a CARD and a non-CARD protein region, which suggests that many signaling cascades may utilize CARD interactions with non-CARD domains. Rossman, J. et al. (2006). POLKADOTS are foci of functional interactions in T-Cell receptor-mediated signaling to NF-kappaB. Molecular Biology of the Cell [Online] 17:2166-76. Available at: http://dx.doi.org/10.1091/mbc.E05-10-0985. Stimulation of the T-cell receptor (TCR) results in the activation of several transcription factors, including NF-kappaB, that are crucial for T-cell proliferation and gain of effector functions. On TCR engagement, several proteins within the TCR-directed NF-kappaB signaling pathway undergo dynamic spatial redistribution, but the significance of these redistribution events is largely unknown. We have previously described TCR-induced cytoplasmic structures called POLKADOTS (punctate and oligomeric killing or activating domains transducing signals) that are enriched in the NF-kappaB signaling intermediate, Bcl10. We now show that these structures are formed only under conditions that promote efficient NF-kappaB activation. Furthermore, POLKADOTS formation is dependent on functional domains of specific NF-kappaB signal transducers. Through use of a photoactivatable GFP, we demonstrate that POLKADOTS contain both a highly stable and a rapidly equilibrating protein component. FRET analyses show that POLKADOTS are sites of enriched interactions between Bcl10 and partner signaling proteins. These observations strongly suggest that POLKADOTS are focal sites of dynamic information exchange between cytosolic intermediates in the process of TCR activation of NF-kappaB.